Did Tariffs Cause Great Depression? The causes of the Great Depression have been debated for decades. The problem with all of the analysis is this same attempt to reduce the cause to a single event. In school, we read the Great Crash by Galbraith. He was a socialist so he blamed the corporations and never bothered to ever even mention the Sovereign Defaults of 1931 for that would have put blame on government instead of the private sector. The argument that the tariffs at least “contributed” to the Great Depression. 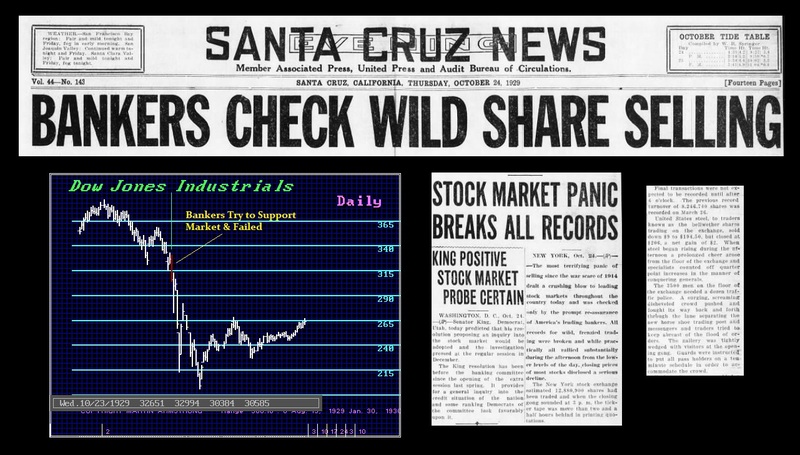 Smoot-Hawley wasn’t signed into law until June 17th, 1930, when stocks had already taken a nose dive from 1929 peaks. 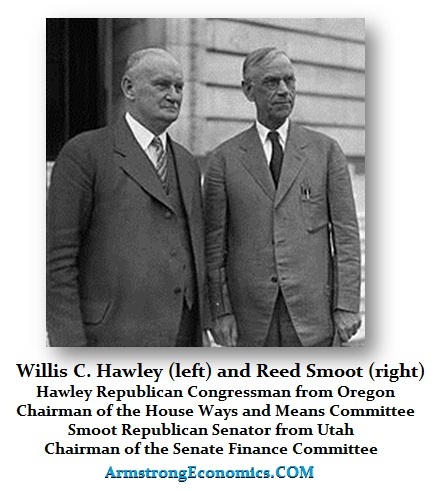 Cato Institute’s Alan Reynolds argued that Smoot-Hawley was an ongoing drag on the economy and that it was, in fact, a substantial contribution to the stock market arguing that traders saw it coming and acted in anticipation. The argument on the one hand correctly states that traders acted in anticipation, but it incorrectly adopts the position that BUT FOR the tariff issue, the stock market would have continued higher anyway? Moreover, the pretense that someone the Smoot-Hawley Tariff created or contributed to the Great Depression ignoring the European Sovereign Debt Crisis, is really a specious argument. This ignores the entire issue of tariffs that predate Smoot Hawley. The Emergency Tariff Act of 1921 was a stopgap tariff measure which was rushed out and put in place until Congress could deal with the issue. The Republican Party wanted to quickly reverse the low rates of the Underwood-Simmons Tariff of the Wilson administration prewar. Protectionism had never died-out but remained merely dormant on the back-burner during World War I. After the war, the supporters of tariffs based their arguments on both economics and nationalism. They argued that the economic prosperity which occurred during the war as America produced the food for Europe and goods, unfolded because there was no competition from imports and therefore it was the abundance of exports that created the economic boom. While on the surface this was correct, they overlooked the problem that Europe could not produce in the midst of war and therefore American production sustained Europe. Now that the war had ended, European imports would increase and this would threaten the current economic prosperity. The protectionists further argued using nationalism stating that Americans would now suffer economic hardship after sending our boys to fight in a war that America did not start. They argued that America should remain in isolationism as a policy staying out of international affairs. Nationalism was on the rise in the United States, as the Senate, in the last days of the Wilson administration voted against joining the League of Nations. 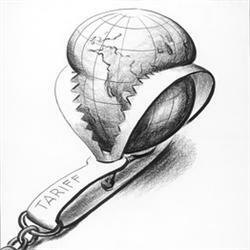 Isolationism, nationalism and the concern for continued prosperity merged and gave support to the protectionists to push their arguments for higher protective tariffs. 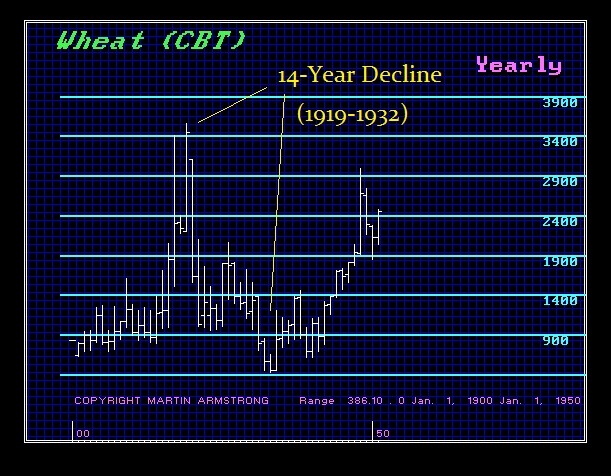 These trends led to the passage of Emergency Tariff in 1921 and then to the Fordney-McCumber Tariff a year later. The rates of these tariffs rivaled the protectionist Payne-Aldrich Tariff of 1909 and were considerably higher than the Underwood-Simmons Tariff passed in 1913. Tariffs were in place throughout the 1920s. Smoot-Hawley has been criticised as a major cause of the Great Depression with no mention of the tariffs that predated the 1930 legislation. The tariff issue was by no means something that was scaring the stock market. The trend from 1927 into 1929 was one of a major shift in assets from bonds to equities. The smart money began to see that the real crisis was debt. This is a serious problem for even today the debt to equity ratio has varied from 7:1 to 10:1. When only a small portion of smart money begins to shift to equities, this becomes a bottle-neck and what happens is prices rise exponentially in what I have labeled a “Phase Transition” meaning that prices at least DOUBLE. This is a not really Asset Inflation where assets merely rise in proportion to the decline in the currency. A “Phase Transition” typically marks a shift in capital whereby it concentrates into one sector and often one country. 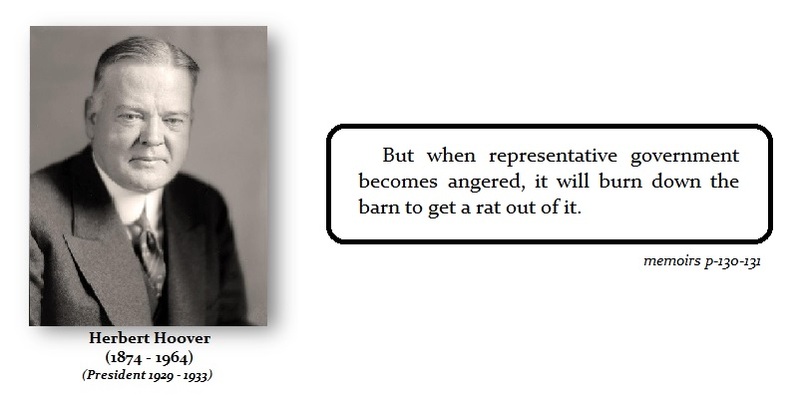 Irving Fisher was a prominent economist of the day who lost his credibility when he came out and said the market had reached a new plateau and thus it would not crash. 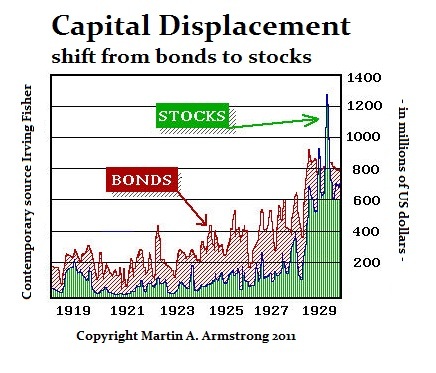 Part of his reasoning was this shift in capital from bonds to equities. I did not realize that this is a phenomenon I call a Phase Transition signals the end of a trend and not the beginning. The shift from bonds to equities can lead to a new plateau PROVIDE it takes place gradually as a trend. When it erupts short-term and causes a doubling in price, this is a warning sign that we are dealing with a bubble rather than a broad ban shift in the investment trend as was the case following the turn of the Economic Confidence Model back in 1985. That case, when the Dow Jones Industrials were at the 1,000 level, we forecast we would see 6,000 in a few years. That was the shift in trend for cyclically the new wave was beginning not ending and we would move into a Private Wave (shift to equities) and were concluding the end of a Public Wave (when bonds are the #1 investment strategy). The resentment toward Germany was really too great, particularly for the French. The reparation payments imposed on Germany led to the revolution in 1918 and the overthrow of the Germany Emperor. These payments could only be made through gold, services or goods. The Germany people were being punished for the action of the political leaders. France broke ranks and began in 1928 enacting a new tariff law and quota system. This really was targeted at Germany and if they could not sell goods internationally, then they could not make reparation payments. This would eventually lead to proposals to allow Austria and Germany to merge in 1931 to which the French began shorting German bonds in the marketplace. Additionally, the economic shift in trend due to the innovation of electricity combined with the combustion engine had drastically altered the economy. 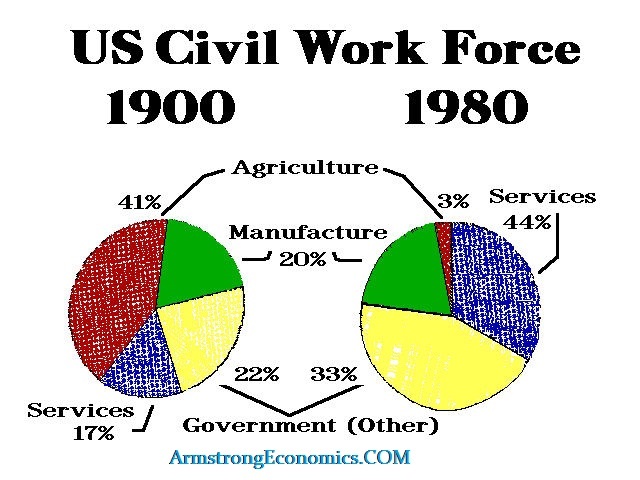 In 1900, about 40% of the civil-workforce was employed in agriculture. By the late 1920s, the United States economy has changed remarkably. There were exceptional gains in productivity due to electrification, which increased production of goods and the combustion engine which profoundly altered agricultural production. With tractors replacing horses and mules, previously, up to 25% of the agricultural land had been used to feed horses and mules. This land suddenly became available to produce crops. The ability to produce food soared and exceeded market demand creating what was called overproduction and underconsumption. This is what Senator Reed Smoot, who was a Republican from Utah and chairman of the Senate Finance Committee, and Congressman Willis C. Hawley, who was a Republican from Oregon and chairman of the House Ways and Means Committee, were focused on listening to farmers who wanted high tariffs to prevent competition. Neither Utah nor Oregon were industrial states. Nonetheless, because of World War I and the wholesale destruction of the European economy, the United States was still running a trade account surplus as manufactured exports of goods were rising rapidly. Therefore, Smoot was looking primarily at the food exports which had been declining as Europe found it easier to restore agricultural production than manufacture goods requiring the construction of plants. The actual value of food imports was a little over half that of manufactured imports and thus the farmers were crying for help in an industry that was changing forever. It was NOT true that the markets were so concerned about the tariffs issue when the industrial production was in a trade surplus and profits were rising. 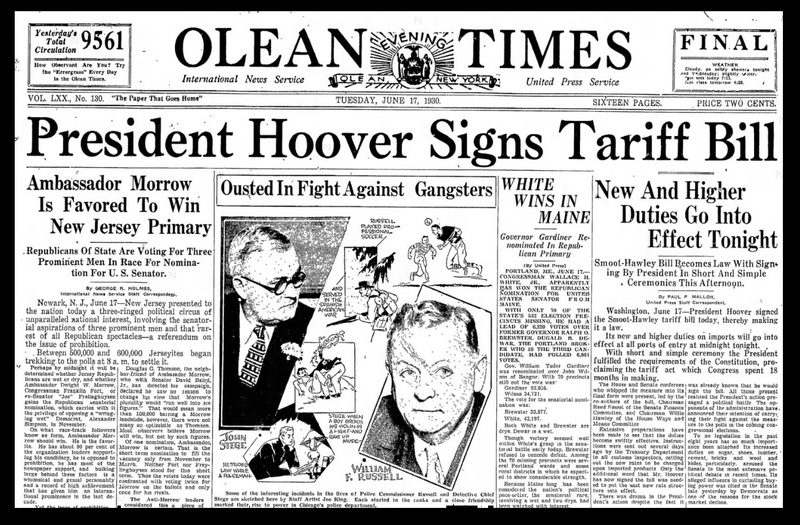 The 1928 Presidential election saw Herbert Hoover promise to help the farmers by increasing tariffs on agricultural products. Upon winning the election, Hoover did ask Congress for an increase of tariff rates for agricultural goods and a decrease of rates for industrial goods. He saw this as a balancing act to appease trading partner nations. Indeed, the House passed a version of the act in May 1929, increasing tariffs on primarily agricultural products. Those who have blamed Smoot-Hawley as a major cause of the 1929 Crash argue that when the House passed the bill on May 28th, 1929, which was the first version, the stocks were battered. This is simply not true. The bill was passed on Monday 28th which was a low and it was not attributed to the tariff bill. On May 3oth that week, the British elections took place and ended in a hung Parliament, which was regarded politically as a crisis. The following day, the Ford Motor Company signed a nine-year contract with the Soviet Union. The Soviets agreed to purchase $30 million worth of Ford products within four years while Ford agreed to provide technical advice and help build an automobile factory in Nizhny Novgorod. 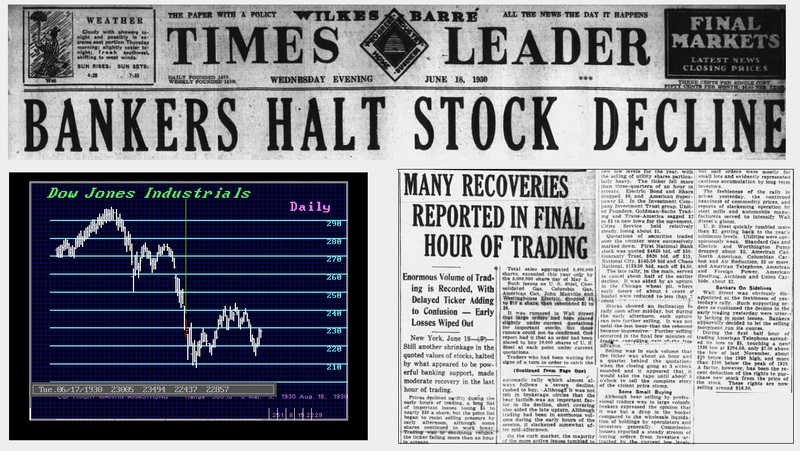 To say the market responded negatively in May 1929 in “anticipation” of the tariffs was simply not true. 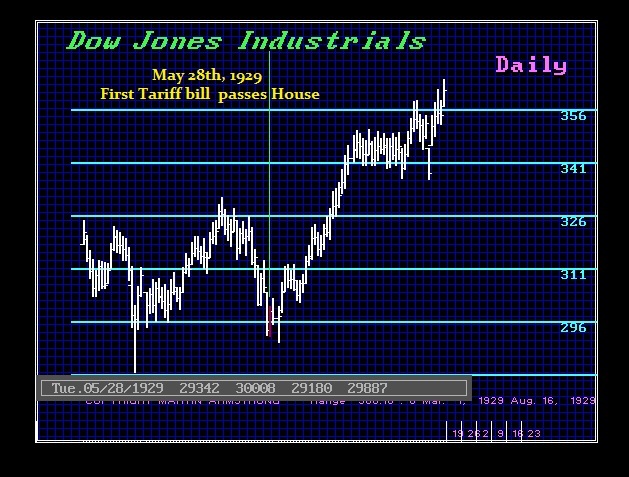 They further argue that on October 23rd, 1929, a Wednesday, it became clear the tariffs would be much broader than first believed. Again they portray the tariffs as the reason for the crash. I found no headlines to support that interpretation, which appears to be predetermined. In fact, that very day of the 23rd the bankers attempted to support the market. The downside of such intervention is when it fails, then confidence collapses completely. Also on that day, there was an assassination attempt on the Italian Crown Prince. He narrowly escaped with his life. This focus on tariffs as the culprit for creating the crash was an argument from the Democrats as they did against Reagan with “trickle-down” economics. Along with such tariff proposals, some of the senators advocated a detailed investigation of the Federal Reserve Banking system, as put forth in the pending resolution of Senator William Henry King (1863 – 1949) who was also a Democratic representative from Salt Lake City, Utah who served in the Senate from 1917 until 1941. Senator Carter Glass (1858 – 1946) of Virginia, who one of the authors of the Federal Reserve banking act and then the Glass-Steagall Act, also in the midst of the October crash the time to add to the crisis pushing his bill providing for the imposition of a 5% excise tax on sales of stock which had not been held over sixty days. It was his present plan to offer the bill as a “rider” to the pending tariff bill. To say that people feared the tariffs, which really did not impact the industrial stocks, is absolutely absurd. They were concerned about a 5% tax on stock investment the Democrats were trying to stuff into the tariff act. The Democrats contributed to created the crash in 1929 with these proposals arguing against the rich. There was also talk of an investigation into the stock market decline to blame someone. Eventually, this would take place and lead to the creation of the Securities & Exchange Commission (SEC). Herbert Hoover in his memoirs apologized for the investigation into the stock market. On top of that, two men were arrested for placing a car on the train track which would have wrecked the coming train carrying President Herbert Hoover. No headlines I found covered tariffs as some dark omen for the economy. 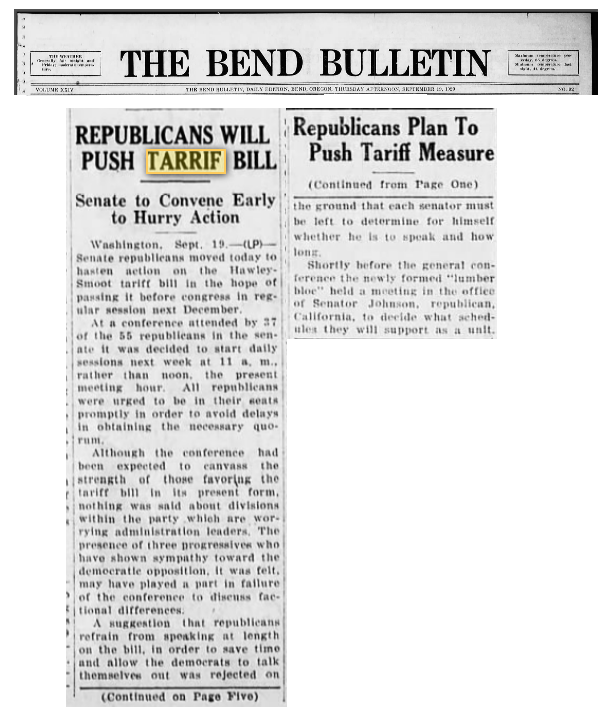 The Senate debated its tariff bill until March 1930, with many Senators trading votes based on their states’ industries. It was not purely supported by Republicans. The Senate bill passed with 39 Republicans and 5 Democrats voting in favor of the bill. The conference committee then aligned the two versions, largely by moving to the greater House tariffs. The House passed the conference bill on a vote of 222 to 153, with the support of 208 Republicans and 14 Democrats. The Democrats who voted for the bill were primarily influenced by the farmers. The Tariff Act of 1930 (codified at 19 U.S.C. ch. 4), commonly known as the Smoot–Hawley Tariff or Hawley–Smoot Tariff, implementing what would be called “protectionist” trade policies was signed into law on June 17th, 1930. 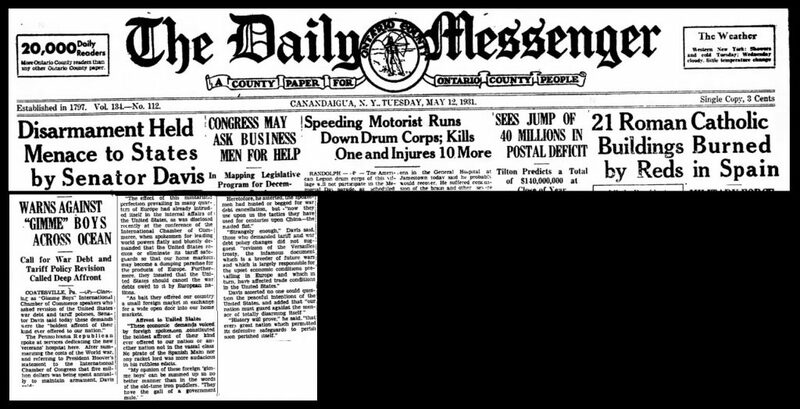 Once again, when Smoot-Hawley was passed, I found no damning headlines how this would end the economy. The bankers were in once again attempting to manipulate and save the market on the very day that Smoot-Hawley was enacted. I found no commentary that attributed the decline to the tariff issue. The day the bill was signed, the Democrats argued that the crash was because of the tariff act, which completely ignored everything else and was used simply as a political criticism of the Republicans. As the press wrote: “It increased duties on sugar, shoes, lumber, cement, bricks and wool and hides, particularly, aroused the Senate to the most extreme political debate in recent times.” Sadly, because the Democrats kept trying to blame the Great Depression on the Republicans, we have the entire tariffs issue still a present view of creating the crisis. Spending was being cut especially to the military. The debated was thus really focused on the cut in spending and the tariff issue on top of aid to Europe. Many in Congress began to consider the Europeans calling them the “GIMME BOYS” for they wanted free access to the US market, blocking access to their markets to rebuild their economies. We have to understand that the entire tariff issue began because of the overproduction of agriculture and that this had been 40% of the entire civil-workforce. The economy was transforming from an agricultural based system to one of industrialization. This economic transformation was NOT understood by politicians. Then in 1931, the rug was pulled out of the world economy. With the bankers’ attempts to support the market always failing, the confidence level kept declining. Government and the bankers were suddenly cast in a light of total incompetance. Survival became one dependent upon oneself.